Make your mornings easier by organizing your clothes. It’s hard to get dressed when you can’t find anything! If you clean out your closet regularly and organize your clothes, everything will be much easier to find. 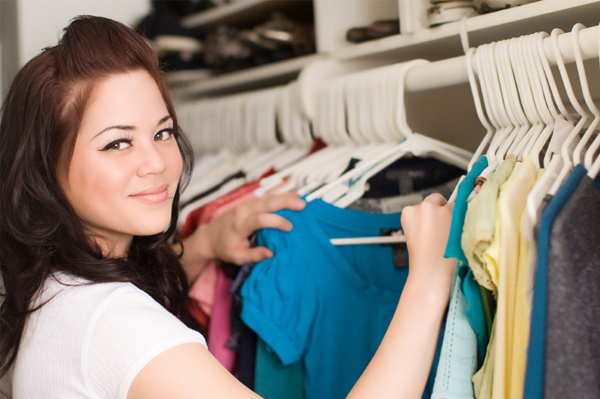 Once your closet is clean, it’s time to take inventory of the clothes that you have. Take everything out of your closet and organize your clothes into three piles — keep, fix, and toss. The clothes in the keep pile will obviously go back into your closet. Clothes that need repairs or cleaning should be placed in a bag and put in your car immediately. You can drop them off at the tailor or dry cleaners the next time you leave the house. For clothes that you no longer wear, you don’t need to throw them away. “Many people have tightened their budgets and people are finding new ways to make their money stretch further. Sell clothes through online auction sites or a garage sale,” says Egner. “Hold a ‘Trading Party’ with girlfriends to acquire a new wardrobe without spending any money. Donate the remaining items to a tax deductible charity. To organize your clothes, Kate Leser of A Distinctive Image offers these tips for weeding out unnecessary items quickly and painlessly. For instance, 60 percent of your time is spent at work so, 60 percent of your wardrobe needs to be work clothes. Twenty percent social time warrants 20 percent of the closet be filled with your “going out” clothes, or whatever you deem social. Maybe 10 percent is spent working out, so keep 10 percent of those necessary items. (I’m sure 20 pairs of sweatpants is more than 10 percent!) Your last 10 percent may be your weekend casual and comfy clothes. 2. Only keep items in your most flattering colors. Can’t figure that out? Compare several shades of the same color, looking for the color that makes you look radiant — not flat or dull. For complete confidence, have your colors analyzed by an expert. It will save you time and money! 3. Your face shape determines your most attractive necklines, collar points, and fabric patterns. Are you contoured or angled? Mimic your face shape. 4. Your body silhouette determines your best clothing styles. Look where you curve in and out and find clothes that do the same. If you are without a lot of curves, don’t buy a jacket cut for a Marilyn Monroe shape. It’s easier to mix and match your closet if you stick to two dominate “themes.” For example, you like classic pieces (You are Classic) but also like stand-alone statement pieces (You are Dramatic), so keep only those items that fall into these two categories. Let go of that romantic, lacy blouse you bought on a whim and never wear. To maximize your space and organize your closet, buy closet organizers such as shelving, baskets, boxes, and bins. These items may be purchased for relatively little expense at your local superstore. If you have some money to spare, consider designing a custom closet system or having your dream closet built from scratch by a professional.